Unity - What does it mean to you? Can a group form cohesively without some underlying unity between them? Probably not, and they can’t bind together entirely by choice either. Unity is the reconciliation between what is instinctual and what is intentional within a group of people. Perhaps unity comes from the natural connection between people, and becoming mutually conscious of our connections is what we call unity. Can—and do—we choose unity, or is unity something that only happens when we look into the yearnings of others and find ourselves? No matter the answer, it is clear that unity has power. 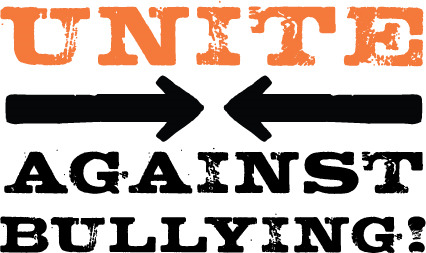 PACER’s National Bullying Prevention Center has been using the power of unity to to unite students, parents, teachers, and community members against bullying. They started and have been celebrating National Bullying Prevention Month each October since 2006, and in 2011 created Unity Day on October 9th. PACER (Parent Advocacy Coalition for Educational Rights) is an organization, created in 1977, dedicated to helping improve the quality of life of disabled children and helping create a support system for parents with disabled children. In 2006 PACER created the National Bullying Prevention Center in response to concerns and fears of parents with disabled children who were bullied in school. Today, the organization has grown and provides a host of educational materials for schools, communities, and parents to help with bullying prevention programs. Unity Day is celebrated both online and offline in a show of support of students struggling with the stigma of being bullied. To participate in Unity Day, schools and communities are encouraged to wear the color orange, write UNITY somewhere visible on their person or belongings, hang banners displaying the event, and wear an orange unity ribbon. Participants can purchase their own unity banner on the PACER website; however, to make the event more inclusive and interactive, schools could consider discussing the issue of bullying and students could create their own unity banners reflecting how they believe they can take actions. Instructions and details about the unity ribbon and about getting involved can be found here. Unity Day also takes place online. Participating in Unity Day could mean sharing it via social media because social media can spread information faster and farther than anything else. The National Bullying Prevention Center recommends changing one’s Facebook status to “UNITY DAY, October 9th. Join the movement to make it orange and make it end! If you are being bullied, you are not alone. Unite and be a champion against bullying!” However, students could go beyond a generic phrase and harness the power of social media by posting their words of encouragement and support for October 9th. Joining the Unity Day Facebook event and posting picture wearing orange and creating posters are some other ways to get involved online and share the fight against bullying via social media. With these basic activities, anyone can get involved in Unity Day and reflect upon the challenges faced by students bullied in school. Schools can go the extra mile in celebrating Unity Day by addressing bullying with the student body. Serious class discussions and forums could take place to get students’ feedback about how they’ve experienced bullying, what their thoughts are about it, and how it should be dealt with. The National Bullying Prevention Center also has instructions for hosting a Unity Dance accompanied by optional music and choreography to the song “You Can’t Take That Away from Me” by Nashville musicians Tim Akers and Libby Weavers. PACER also has an online petition for students to sign in support of students being bullied and in hope of ending bullying. Students can also get involved by using their artistic abilities to talk about bullying and design a way to symbolically represent unity. Additionally, “The Legend of Spookley the Square Pumpkin” is an accessible way to teach younger students about bullying. The story, available in both movie and storybook format, tells about a Spookley who is a square pumpkin living in a patch of round pumpkin. The story and its accompanying lesson plans can help teachers engage their students in a discussion about bullying by using a simple story and applying it to reality. To fully benefit from the message and objective of embracing Unity Day, schools and students should attempt to really involve participants in the event and draw attention to both the problem and solution. More information and resources to help spark a celebration of Unity Day can be found here. Unity has power, and harnessing that power is the goal of Unity Day. Uniting people online and offline is like one big petition against bullying. People are called upon to petition their support in the colours they wear, the things they share online, the discussions they have about conflict resolution, and in the form of an actual petition to sign. We think of the purpose of petition as a unified group compelling someone to change by a show of support for the issue. Spreading awareness is a big part of Unity Day, but awareness is only useful if it promotes action. Though Unity Day is an annual event, hopefully one year it will not be necessary. • KidsAgainstBullying.org is for elementary school children. • TeensAgainstBullying.org is for middle school and high school students. • PACER.org/bullying is for parents, educators, and other concerned adults. This post was written by NobleHour Special Contributor Natasha Derezinski-Choo. Derezinski-Choo is a rising junior at Grimsley High School in Greensboro, NC. I’ve been here too many times. The lights are dimmed and shades drawn to allow the flashing white light of the television screen to illuminate the rows of students sitting, legs crossed, on the blue storytime carpet. Necks crane uncomfortably at the television resting upon a tall, black, movable cart for teachers to easily move the schools technology, but also resulting in sore necks for students sitting at the feet of the stand. Playing on the screen of a TV, older than most of its young viewers, is a scene familiar both in reality and fictitiously. It goes something like this: Billy pushes Kevin on the playground, claiming his turn at hopscotch has come early. The playground children notice, and a few children begin to stand and watch. Kevin runs away crying, giving the children more reason to laugh. The clip cuts and someone, maybe a teacher or counselor, begins talking about it: bullying. It happens in every school. Not just the incident between Kevin and Billy, but the response: the video, the tall TV, the stretched neck, and the ensuing discussion. Perhaps it takes place in some other form with the video substituted by a different medium - like a book or a role play, but the cast is still the same: the bully, the victim, the bystanders, and in the happily-ever-after version, an upstander who stops the bully. Tormenting another person is wrong; kids can see that without the theatrics. However, it still goes on and horror stories in the news of kids literally being bullied to death have parents and teachers saying that enough is enough. 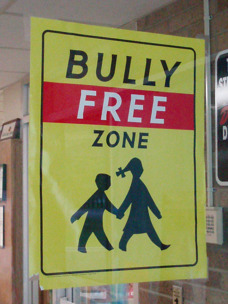 And so the array of bullying prevention programs keeps expanding. Students have heard it all in assemblies, presentations, and class lessons. The repetitiveness makes the term “bully” a little cliché in the eyes of students. It seems like a word grown-ups use to explain something children experience. Schools try to find different ways to convey anti-bullying messages, but, with anxieties continuing to rise about the issue, it seems none have found a concrete solution. The programs designed to curve bullying often stem from the same set of principles, but often these programs lack success because they fail to take into account an open discussion with students before making drastic changes to school environment and student interaction. Bullying is a problem because it is a traumatic experience for children that can haunt them into adulthood. Stopbullying.gov has identified some of the effects of bullying on victims: “Depression and anxiety, increased feelings of sadness and loneliness, changes in sleep and eating patterns, and loss of interest in activities they used to enjoy. These issues may persist into adulthood [. . .] Health complaints [. . .] Decreased academic achievement.” Targets of teasing and rumors are negatively affected by the emotional stress put on them, affecting their studies and outlook on life. The news that puts parents on edge about their children possibly being bullied is that of suicides of bullied students. Although this is not to be trivialized, the correlation between the two can be sometimes exaggerated. Stopbullying.gov says the following on the matter: “Although kids who are bullied are at risk of suicide, bullying alone is not the cause. Many issues contribute to suicide risk, including depression, problems at home, and trauma history [. . .] This risk can be increased further when these kids are not supported by parents, peers, and schools. Bullying can make an unsupportive situation worse.” Students know these problems inside out, but the way schools try to handle these situations is sometimes not conducive to how students would prefer to see things change. Recently, a school’s attempt to stop bullying online (cyberbullying) has sparked outrage among its students. The students of Stockton High School in Stockton, California are protesting a school’s new policy calling for the creation of a Social Media Contract. The rule dictates that students who wish to participate in extracurricular activities such as sports teams and clubs must sign a contract promising to detach themselves from online bullying or face being kicked out of school clubs and sports. The Lodi Unified School District claims that online bullying is a growing problem and that the new policy is to protect students. Officials stand firmly behind the new rules. Students, on the other hand, are not pleased. Their objection to the contract is rooted in the idea that it restricts free speech. The harshness and ambiguity of the wording are also major concerns of the students. Sports, clubs, and outside activities are under the threat that “Big Brother” is watching. Moreover, students who don’t involve themselves with extracurriculars are more likely to be bullies, and the protesting students feel discouraging their pupils from such activities is a step in the wrong direction. Why does the rule only apply to some students and not all? At the heart of it though, students feel they are essentially being bullied into agreeing to these terms by the school district. Both feel that bullying is a problem, but are finding the solution cannot be forced. Creating a safe, school environment free of harassment and prejudice takes the ideas and actions of both students and administrators. When children grow up, the bullies don’t go away. The playground just gets bigger. The situation replays with the same roles: the victim, the bully, and the rest of us watching silently. Politicians alienate each other in campaign advertisements during elections. The media bullies celebrities with rumors and criticism that drive some to substance abuse and depression. Stereotypes, prejudice, domestic abuse, intolerance, genocide, etc. : these are all part of a greater reality in which people can be cruel to each other. What is called bullying is just a small part of a greater pattern. The world is not fair because people aren’t. How our culture approaches violence and injustice translates to how children will handle it on the playground. Problems are easily identified but also easily exaggerated, and effective solutions are difficult. However, it starts with how individuals act and what each person tolerates as right or wrong. Students are taught not to be passive bystanders, and people of all ages should lead by example. Billy pushes Kevin on the playground. The rest is up to you.